Have you ever looked at celebrities and wonder how they stay so young looking? The answer often lies in invasive and intensive plastic surgery. Before you get ready to go under the knife, you should know that there’s another way to get a facelift. A microcurrent facial is a surgery-free way to rejuvenate your skin down to its deepest layer. What Does a Microcurrent Facial Involve? During a microcurrent facial, we treat your face with extremely low-voltage electrical currents with LED light added to the device. You don’t need to be worried about being shocked during the facial. It would take one million microcurrent machines to power a 40-watt bulb. The small currents stimulate your body’s cells, telling them to repair damaged skin and create more collagen and elastin. Collagen and elastin strengthen your skin and give it elasticity, helping it look smooth and healthy. Think of your microcurrent facial as a workout for your face. In the same way strength training breaks down muscles and encourages them to grow back stronger, this facial breaks down aged, dying skin cells and encourages the growth of healthy, new ones. A microcurrent facial works on all levels on your skin. The currents penetrate down to the dermis, the deepest layer of your skin, encouraging production and repair of collagen. Simultaneously, the current helps break down the signs of aging on your top layer of skin, the epidermis. During your microcurrent facial, you should feel next to nothing. 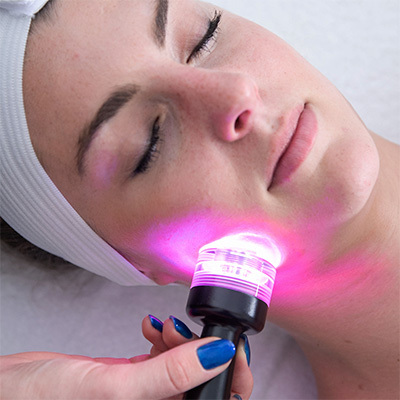 Many people report feeling calmed by the smooth motion of the microcurrent wand as it moves across their face. Some people even say they feel energized by the microcurrents and leave their appointment feeling like they got an amazing night’s rest. 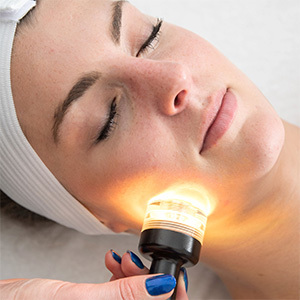 One of the biggest benefits of a microcurrent facial is that it comes with virtually no downtime. A traditional, surgical facelift requires at least two weeks of intensive healing, during which you’ll have to give up your normal routine. What’s more, it can take up to a full year for all bruising and swelling to fade completely! With a microcurrent facial, you can get back to doing what you love right away. Walk out of your appointment and straight into meetings, lunch with friends, or whatever else you have on the calendar that day. You’ll probably get compliments about how you’re glowing! Do Microcurrent Facials Truly Produce Results? Increase collagen production by 14 percent. Increase elastin by 48 percent. Increase blood circulation by 38 percent. If you’d like more information about a microcurrent facial and how it could benefit your skin, we’re here to help.